concluded on October 9, 2016. This year the festival included documentaries from Armenia, Germany, Russia, and the USA that were created in 2015-2016. 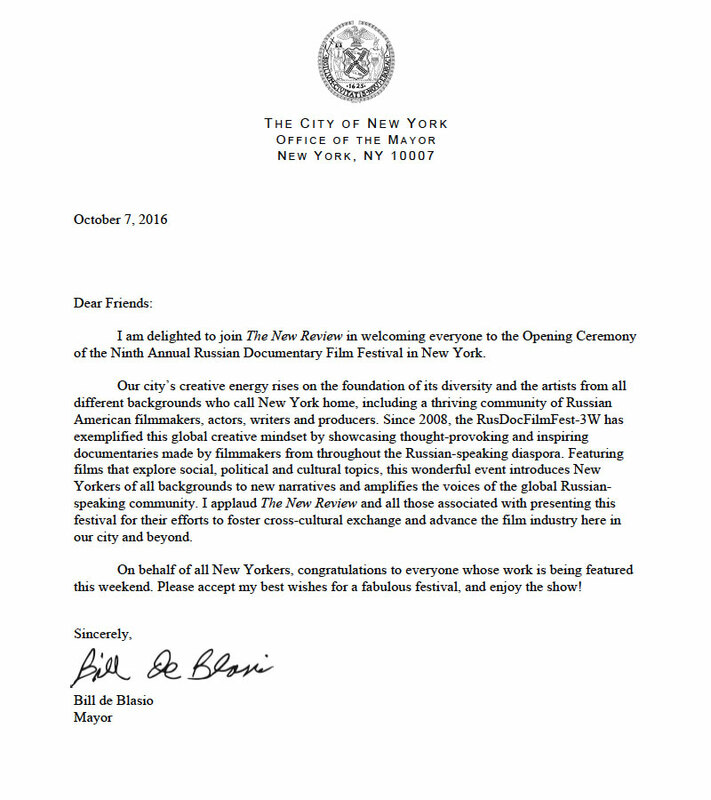 The Ninth Festival took place at the Anthology Film Archives, DCTV, and Brooklyn Public Library. 24 documentaries and 6 debuts by newly graduated film-directors were screened during the three festival days. 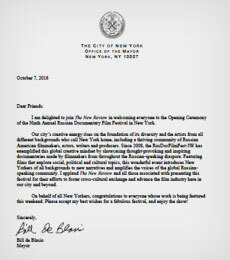 15 documentaries were selected for the competition. There were several video-presentations of sponsors and partners of The New Review Corporation, the festival’s organizer, among them the Zimin Foundation, the general sponsor of The New Review, and the Yeltsin Center (Russia). The festival program included several Q&A sessions with film-directors from Russia: Sergei Miroshnichenko, Beata Bubenets, Elena Yakovich, Eugeny Khovaev, sound-directors Nikita Gankin and Eugeny Gurianov, as well as film-directors and producers from the U.S.: Sandra Schulberg, Jonathan Alpert, Semyon Pinkhasov, Edward Staroselsky, and Victor Ilyukhin. — Ari Kagan (U.S.), journalist, Democratic District Leader, Community Liaison for City Comptroller Scott Stringer. — Jon Alpert (U.S.), 16 Emmy Award laureate, three DuPont Columbia Awards laureate, nominee of two Academy Awards in the category of Best Documentary; Co-Director of the Downtown Community Television Center. The Humanitarian award recognizes outstanding individuals who dedicate their time to fighting indifference, intolerance, and promoting humanistic ideals, and whose accomplishments are consistent with the goals of the New Review Corporation. From the Pushkin Society in America – Special Diploma and Pushkin Society’s Medal – film The Mystery of Mandelstam’s Archive. The Story of Sonia Bogatyreva, film director Yelena Yakovich (Russia). From Diana Bagrationi Foundation (U.S.) – film Competition, film director Eugeny Khovaev (Russia), – «For Reflection of the Artistic Phenomenon in the Culture of the XXI Century».